Last summer Agrumi was commissioned by ITV’s hugely successful, long-running show ‘Love Your Garden’ to create a topiary giraffe for client Joan Myers. Every week while the show is on its fantastic team of expert gardeners is challenged to build a new garden for deserving people like Joan. Joan has devoted her life to paediatric nursing in the NHS and helping children in Africa. In 2013 she was awarded the OBE for Outstanding Services to Nursing and named as one of this country’s top 50 Inspirational Leaders in Healthcare. Her commitment to nursing meant however that her garden was sadly neglected. 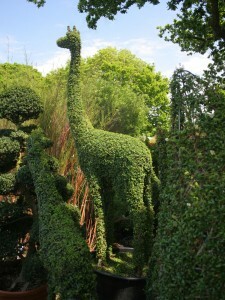 When the ‘Love Your Garden’ team offered to help, Joan said she would like a beautiful, tranquil space in which to reflect, pray and entertain; requesting a topiary giraffe to remind her of Africa. ITV came to Agrumi for the topiary and we were only too pleased to oblige.